What would happen if your opinion expressed on the Internet had been deliberately fabricated by someone else? What if you no longer had the freedom of speech, even online? The recent ‘D_ruking’ scandal has shaken the Korean society, bringing warnings and concerns about the freedom of speech of people that are expressed online. ‘@D_ruking’ is the name of a Twitter account, where the posts related to politics and economics were often posted. The incident first came to the surface when the account user and his followers were manipulating the comments of news articles provided within the Naver portal website. While ‘D_ruking’ has been put under restricted prosecution, the manipulation problems of news article comments still remain. In fact, when looking back, the Korean cyber society has been bothered by the issue of comment manipulation on news articles consistently. The 2012 case of National Intelligence Service Korea also followed a similar context as ‘D_ruking’, where a number of National Intelligence Service agents interfered with the 18th Presidential Election of Korea. The agents published politically weighted posts and comments that contributed in forming the online public opinion on the relevant portal website. People continue to debate on the primary reasons that allowed the above outcomes. In fact, a big judgment section has been put on the news article commenting the policies of Naver and other portal websites. Many concerns remain regarding online commenting policies, as it is assumed that within each portal website, there is a possibility of comment manipulation, and therefore the possible cause of fabrication of public opinion expressed online. Currently, the major portal websites such as Naver and Daum provide the readers with news articles that allow public comments to be uploaded regarding the published article. Usually, a comment with the most number of user likes appears at the very top of the commentary system and is considered as a comment that best describes the opinion of the article readers. 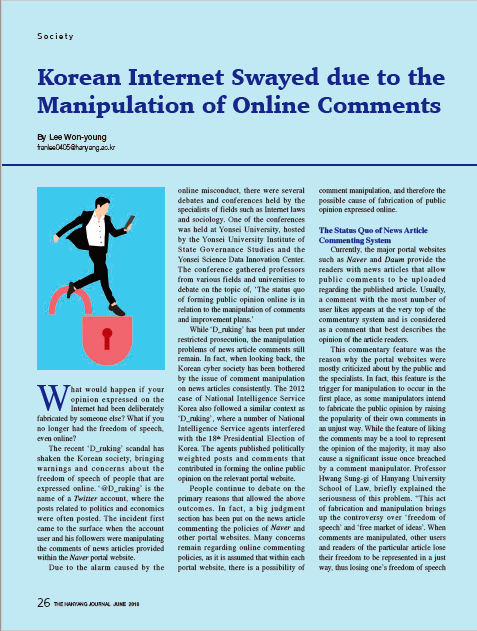 Under the current Korean legal system, there is no particular law that can possibly lead to a punishment for manipulation of online comments. Therefore, the government should first create a long-term solution by legislating a more elaborate legal system that can not only deal with the consequences of manipulation, but also prevent such manipulation from occurring. “When viewed from the surface, there are many actions that both the portal websites and the government can take, such as the introduction of an ‘out-linking’ system, or temporarily adjusting the commentary policies within the portal. However, the force that ultimately regulates the society is, in the end, law and order, followed by proper enforcement. While it may be difficult to manage an Internet society with the control of the government, the legal system should still be constructed,” explained Professor Lee Won-jae, from the Department of Sociology in KAIST. A solution that can bring about its effectiveness within a short amount of time is needed to bring social awareness of this issue. In this Internet world that is so vast and unending, all the consumers of any kind of Internet data should be aware of the contents, and the potential irregularities that they are receiving. This applies in the same way when one is creating content, making sure that one’s comment lies between the border of claiming freedom of speech, and not causing harm to other users. “Especially when it comes to the matter of news article comments, the readers of the information should show a ‘recognized indifference’ and to other unnecessary arguments that may sway one’s original opinion on the matter. Meanwhile, the view should be more focused on the original content itself,” explained Professor Kang Jeong-han. It could be tempting to view others’ opinions on a matter and compare them with one’s own. However, the consumers should take a more skeptica view towards the information that they are receiving, which can eventually lead to the advent of more high-qualified contents to take dominance over the Internet information market in the end. The cyber society is a relatively new world, where even the users are still discovering its new aspects. It is a world that is continually developing. Just like the formation of any other societies in the real world, the only way that this society can also gain its right and just legal system is through trial and error. Until then, the only thing that we can trust and anchor our hope in is our own morality, and that of each other.